As nativist right-wing populism surges across the Global North amidst the exhaustion of social democracy and “Third Way” liberalism, the United States finds itself at the forefront. Elsewhere, right populist parties have led in the polls, as with the Front National in France and the PVV in the Netherlands, or played key roles in seismic political events, as with UKIP and Brexit. But so far, only in the US has the right populist wave captured a major political party and ridden it to power. The improbable election of Donald Trump reflects deep crises within the US political system, but also this broader crisis of modern liberalism. The early months of the Trump administration have been chaotic, but one thing remains clear: despite Trump’s rhetorical appeals to the working class, actual workers and unions have reason to be worried. His public pronouncements about bringing back coal and manufacturing jobs are based on pure sophistry, while his less public moves to gut labor regulations and workers’ rights will hurt workers. Labor’s dire situation predates Trump by decades, but it is likely that his accession to the Oval Office will further embolden labor’s foes, much as Ronald Reagan’s election did in the 1980s. 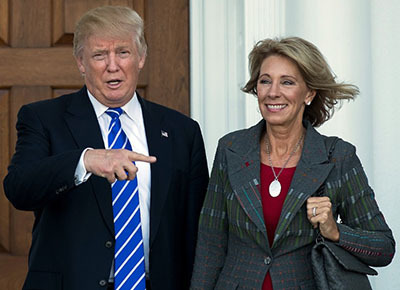 President Trump and Secretary DeVos. Early indications have confirmed these suspicions, as the candidate who portrayed himself during the campaign as a tribune of the working class has packed his cabinet with billionaires and business leaders. Of particular concern for workers are his picks to head the Departments of Labor and Education. While personal controversies and popular mobilization derailed Trump’s first choice for Secretary of Labor, CKE Restaurants CEO Andy Puzder, his replacement, R. Alexander Acosta, presents more conventional but still troubling challenges for labor. His record while serving on the National Labor Relations Board in the early 2000s suggests an employer-friendly attitude towards labor policy common among mainstream Republicans. Meanwhile his Secretary of Education, Amway billionaire Betsy DeVos, has made her name promoting school privatization and attacks on teachers’ unions in her home state of Michigan and elsewhere. Policy-wise, Trump has run into trouble implementing much of his agenda, most notably with his failure thus far to repeal Obamacare and courts blocking his Muslim travel ban. However, he and his Republican counterparts in Congress have had much less difficulty rolling back a slew of worker protections proposed or enacted under the Obama administration. These include an effort to raise the threshold above which salaried workers cannot receive overtime pay, regulations requiring federal contractors to disclose pay equity and workplace safety violations, rules on mine safety and exposure to beryllium, and mandates for private sector employers to collect and keep accurate data on workplace injuries and illnesses. On the judicial front, Trump has nominated two reliably anti-union attorneys, William Emanuel and Marvin Kaplan, to fill vacancies on the National Labor Relations Board (NLRB). They are likely to reverse recent pro-labor rulings holding parent companies liable for the labor practices of their franchisees and allowing student workers at private universities to organize. More significantly, after Justice Antonin Scalia’s death last year prevented the Supreme Court from overturning decades of legal precedent and allowing right to work laws throughout the public sector via the Friedrichs case, a new case called Janus v. AFSCME has been filed in Illinois which will allow a Supreme Court now supplemented by the conservative Neil Gorsuch to revisit the issue. At the state level, labor’s situation continues to worsen. On top of recent labor setbacks in Indiana, Michigan, and Wisconsin, the first months of 2017 saw Kentucky and Missouri become the twenty-sixth and twenty-seventh right-to-work states. In Iowa, lawmakers passed House File 291, which, like Wisconsin’s Act 10, restricts public sector unions’ ability to bargain over anything but wages, eliminates workers’ ability to have their union dues deducted automatically from their paychecks, and requires regular union recertification votes. For its part, labor remains stuck in an organizational and political rut. Total union density currently stands at 10.7 percent, and 6.4 percent in the private sector. This is a level not seen since the Great Depression, and well below levels reached in the mid-twentieth century, when one third of US workers were union members. Economically, union decline is a key reason that inequality has risen to levels also not seen since the Great Depression. Politically, it has undercut labor’s organizational clout. Not only are there fewer union voters, but unions are less able to educate and mobilize their existing members. In the 2016 election, despite unions spending millions of dollars and deploying major voter mobilization programs to support Democrats, Trump won 43 percent of union households, and 37 percent of union members. In some of the decisive Rust Belt states, Trump won outright majorities of union households. All told, it’s a grim picture. Some of the details may be new, but they are part of a decades-long pattern of union decline that is quite familiar at this point. As we enter the Trump era, we are not entering uncharted territory. We’ve been here before. The question is how to respond. For at least the next few years, two of labor’s well-worn tactics are off the table. First, labor law reform is not happening, and anti-labor measures like a national right-to-work law are almost certain. Second, with Democrats now shut out at the federal level, and Republicans in control of either the governor’s house or state legislature in forty-four states, with full control in twenty-five, labor cannot rely on favors from sympathetic Democratic Party politicians. Leaving aside the deep crises the Democratic Party currently faces, or the extent to which such a reliance has ever been a good idea, this “inside strategy” is simply not available now. Even less viable is a strategy of “cautious engagement” with Republicans, which is what AFL-CIO head Richard Trumka and American Federation of Teachers President Randi Weingarten seem to be promoting. At the same time, as frightening as the situation seems, now is not the time for labor to retreat. Unfortunately, that is precisely the approach that some unions seem to be taking. Understanding and addressing the threats that the Trump administration poses to workers is a challenge. First, it requires analyzing the particularities of labor’s current challenges in the United States within the broader context of what has happened to labor movements and politics in the Global North in recent decades. Second, it requires addressing a problem that goes deeper than unions’ declining numbers and bargaining power: their eroding ability to shape and mobilize workers’ political identities. Much about Trump and his administration is unique, some say unprecedented. His pre-dawn tweets, his disregard for notions of truth and evidence with which he does not agree, his lack of concern with handling much of the basic day-to-day mechanics of governing, and much more, has dumbfounded his critics on the left and right alike. At the same time, much of his policy agenda and his method of governing has a long lineage. His budget proposal reprises the combination of tax cuts for the wealthy, combined with massive increases in defense spending and massive cuts to social welfare programs, scientific research, and funding for the arts and humanities that President Reagan and subsequent Republican presidents have long championed. Equally Reaganesque is his penchant for appointing cabinet members whose primary qualification involves attacking the mission of the agency they are tasked with leading. Meanwhile, his “America First” economic nationalism goes back further, echoing a perspective prevalent in the pre-World War II era, and which lives on today in various “Buy American” campaigns. Likewise, many of the factors underlying Trump’s victory are particular to the US context. Leaving aside the contingencies surrounding the election itself, these include institutional factors like the entrenched two-party system and the disproportionality of the Electoral College. The first ensured that Trump’s populist mobilization was expressed within the confines of the Republican Party, as opposed to a separate far-right party as is common in Europe, while the second allowed him to win the presidency while losing the popular vote. Also particular is Trump’s electoral alliance with evangelical Christians, as compared to either the resolute secularism or revanchist Catholicism of the European far right. At the same time, Trump’s success is part of a broader right-populist trend that extends far beyond the United States. Globally, these movements share several common traits, including charismatic leaders; a focus on mobilizing around racial and ethno-religious divisions, particularly Islam; and a deep skepticism of experts and elites. Looking beyond the present moment, historical research suggests that such movements tend to grow in the aftermath of major economic crises such as that in 2008. Importantly for labor, right populism has emerged in response to a political vacuum on the Left. Part of this has been the result of a crisis of “third way” social democracy, whereby the traditional parties of the Left adopted the policies of financial deregulation and fiscal austerity that led to economic crisis, abandoning, attacking, and alienating their traditional working-class base in the process. Equally important has been a global decline in labor union power, which has both given employers the upper hand while leaving more workers without any form of collective organization. The resulting disorientation of the Left has created fertile ground for the upsurge of the populist Right. Beyond simply opposing labor and the Left, it seeks to replace them as the “natural” political home for a (white, native-born) segment of the working class. These twin crises of working class representation have hit particularly hard in the United States. Politically, social democracy was never as established as in Europe, and while the Democratic Party was unable to serve as a functional equivalent to the social democratic parties of Europe, its Clintonite turn in the 1990s did provide a blueprint for the rest of the Third Way. Socially and economically, unions are especially weak in the United States, with union density among the lowest in the Global North. And while European unions have generally taken a strong stance against the far right, US unions have been far more fragmented in their response to Trump, as evidenced by Trumka’s abovementioned policy of “cautious engagement” and the building trades unions’ outright endorsement of Trump. Taken as a whole, today US labor faces today a crisis of legitimacy. For all the problems that US unions had in their post-World War II heyday, they were a force to be reckoned with. They negotiated master contracts in auto, steel, mining, and trucking that set wage and working condition patterns for entire industries. Labor leaders like Walter Reuther, John L. Lewis, and Sidney Hillman were household names whose opinions were worthy of regular news coverage. Partially this is the result of decades of sustained anti-union attacks, which have now penetrated traditional labor strongholds like Michigan, West Virginia, and Wisconsin. But that is not the whole story. After all, labor has withstood far more vicious attacks in the past, including facing down state, federal, and mercenary armies. A key part of the problem is that the “special interest” label tends to stick. Even within progressive circles, unions are pegged as one among many “special interest groups,” albeit one with deep pockets and a knack for getting Democratic voters to the polls. Perhaps most indicative of this problem is the care with which unions like SEIU and UFCW have sought to downplay their involvement in recent campaigns like the Fight for $15, the fast food strikes, and Walmart organizing, even as these campaigns have won remarkable victories. Presumably the unions fear that these broad-based campaigns might be tainted if they are too closely linked to labor. The result, as Jake Rosenfeld notes, is that even as labor scores big wins for large swaths of the working class, few are aware of labor’s role. Meanwhile, unions are mainly thrust into the spotlight over political attacks like right-to-work laws that boil down to arguing over technical language about union membership requirements, or contract disputes that are vitally important for the members involved, but can seem distant from the general welfare. Fundamentally, labor today lacks its own core identity. To be sure, any competent labor leader or organizer can rattle off a list of labor’s accomplishments, as well as the tangible benefits that come with the “union advantage.” More sophisticated labor leaders and organizers can discuss and implement smart organizing tactics and strategic campaigns. But as any seasoned organizer knows, movements aren’t built on cost-benefit balance sheets and clever tactics. They are built on vision and relationships. Together, these create powerful collective identities, a sense of being on the same side, of sharing a common fate. Collective identities are crucial because they bring groups of relatively powerless individuals together and change their assessment of where they stand, what is possible, and what they are capable of. Without that reassessment process, workers will quite rationally conclude that organizing is too risky and too likely to end in defeat, and not get involved. At the same time, the lack of a powerful self-defined collective identity gives movement opponents space to define the movement. In the case of the US labor movement, that’s what has allowed the “special interest” identity to stick. It hasn’t always been this way. US labor has a long and storied track record of forging powerful collective identities. Going back to the nineteenth century, early unions like the Knights of Labor organized around powerful ideas of “labor republicanism” and the “cooperative commonwealth” to articulate a broad vision of industrial democracy. In doing so, they highlighted the contradiction between their status as formally free citizens in the political realm, and their status as wage slaves at work. In the early twentieth century, it was the Industrial Workers of the World’s vision of “One Big Union” that mobilized hundreds of thousands of workers. In the 1930s and ’40s, the CIO’s vision of industrial unionism and the spectacle of the sit-down strikes galvanized millions. As an example of how contagious this CIO vision was, soon after its founding in 1935, tens of thousands of workers north of the border in Canada flocked to the CIO banner, even though nobody in the CIO leadership was aware of what was going on, let along lending any kind of material support. 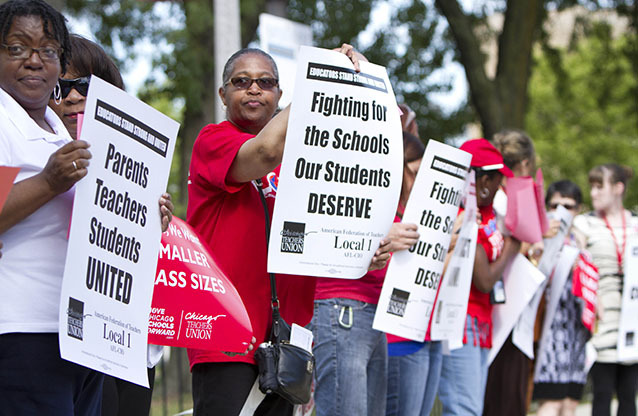 Members of the Chicago Teachers Union picketing outside of Willa Cather Elementary School in August 2012. While these examples showcase the galvanizing potential of collective identities, it is important to recognize that they have a downside. Identities work by creating dividing lines that define who is on which side. Depending on how those lines get drawn, collective identities can divide as well as unify workers. We need only think of the sordid history of divisions based on race, national origin, gender, or craft within the labor movement to see how this has worked. Similarly, unions’ efforts to forge “partnerships” with employers, or to promote protectionist “buy American” strategies, can divide workers by company or country, while blurring divisions between workers and management. The resulting identities can help or harm labor’s fighting capacity. It is also essential to recognize that durable collective identities, the kind that can create deep and lasting social change, are made up of more than words. They are not the product of proper “messaging” or “framing” of issues. Rather, collective identities are created, maintained, and reshaped through sustained, organized collective action. More than anything, it’s this combination of galvanizing ideas tied to durable, deep organization that is missing from today’s labor movement. We can certainly find elements of each. Despite decades of decline, unions still have plenty of organizational infrastructure at their disposal. But this is not tied to a compelling idea or collective identity. Leaving aside forgettable efforts at doing so like AFL-CIO’s “Union Yes!” and “Voice@Work” campaigns, the ideological work of even more sophisticated campaigns like SEIU’s Justice for Janitors has not been aimed at creating a sense of collective identity among its members. Rather, it has been aimed at creating “public dramas” using scripted confrontations to shame corporate targets into making deals with union leaders. Workers in such a model function not as the collective force driving the campaign, but as what Jane McAlevey refers to as “authentic messengers” dispatched by union leadership to influence media coverage and public opinion. We have also seen galvanizing ideas take hold in recent years. These include the aforementioned Fight for $15 (and a union, which usually gets dropped), the powerful counterposition of “the 99 percent” versus “the one percent” that animated the Occupy movement, and Bernie Sanders’ message of working-class justice and solidarity that fueled his improbable run for the Democratic Party’s presidential nomination. These, however, have lacked firm organizational links. In the case of Fight for $15, the real organizational tie to unions was deliberately hidden. Occupy, for all its accomplishments in forcing economic inequality back onto the political agenda, foundered on its inability to build lasting organization. As for Sanders, not only was his campaign hampered by most unions’ reticence to back it, but there is little infrastructure beyond email and fundraising lists to organize the millions of people who backed him. Historically, unions have used two methods to link ideas and organization: strikes and shop floor organization. The first has gotten plenty of attention, grabbing headlines and filling the pages of labor history books. The second, while often overlooked, has been equally important, a necessary building block for the first. Labor scholars, not to mention any seasoned organizer, know the painstaking, day-to-day work that goes into building a strike. Even in cases where strikes seem spontaneous, there is always organization lurking behind. But beyond strike preparation, shop floor organization has been what gives substance to the well-worn slogan “we are the union.” Not only has it provided a necessary check on management’s authority, but it has created the setting for the everyday interactions that build trust, solidarity, leadership, and the confidence that members can act collectively. It was an essential part of union building efforts from the nineteenth century to the CIO and lives on in certain pockets of the labor movement. For the most part though, strikes and shop floor organization are things of the past. Not only are strike rates are near an all-time low in the United States, but evidence suggests that they are no longer as effective as they used to be. Meanwhile, corporate consolidation, financialization, and restructuring means that power and authority have moved not just further up the organizational chart, but have disappeared into a hazy thicket of investment funds, shell companies, and merged mega-corporations. In this new environment, many argue, workplace organizing can only have limited effects. Unions’ leverage must be exerted elsewhere, either in politics or capital markets. Almost by definition, that means that unions’ primary activities must happen at the staff level, in the strategic research and legislative action departments — not in the workplace. Unsurprisingly, unions that subscribe to this analysis, most notably SEIU, have transformed themselves in ways that make their workplace presence even more remote. Without denying that these changes are real, and that global strategies that reach beyond the workplace are necessary to confront globalized capital, giving up on the possibility of workplace organizing has troubling implications for labor, politics, and democracy more broadly. If labor has no way of tying global leverage strategies to workplace organizing, then it is unclear how whatever agreements are worked out between corporations, governments, and unions can actually make daily life on the job better for workers. Agreements mean little without enforcement. At a basic level, workplace organization is necessary not only to make sure that corporations abide by their agreements, but to provide a check on management’s unbridled authority. Janice Fine’s work on the “co-production of enforcement” offers some ideas as to how this might happen, but labor needs to prioritize workplace organization for these ideas to reach the necessary scale. Fortunately, there is another way. We saw it in the massive majorities of Chicago teachers who struck against Mayor Rahm Emanuel in 2012, and then forced him to back down again in 2016. We saw it in the CWA strikers who struck against Verizon for forty-five days last year to beat back the company’s concessionary demands and win pension increases and protections on outsourcing. Politically, we saw it in the work of the Las Vegas Culinary Union, UNITE HERE Local 226, which managed to get even white workers in a right-to-work state to reject Trump this past November. We also saw it in the work of the Massachusetts Teachers Association, which organized against both major parties and billionaire-funded charter school PACs to defeat Question 2, which would have dramatically increased the number of charter schools in the state. These are isolated examples and do not yet approach the scale needed to respond to the challenges that labor faces in the coming years. But they show that it is still possible to strike, and it is still possible to win. In each case, building workplace union culture and organization was key. Broadening this model outwards could provide ways of reversing labor’s fortunes. In a recent message to supporters, Senator Bernie Sanders stated that “The great crisis that we face as a nation is not just the objective problems that we face…. The more serious crisis is the limitation of our imaginations.” In bringing workers together and changing their assessment of what is possible and what they are capable of, labor has the capacity to transcend that limitation. To survive Trump, that work is more necessary than ever. Barry Eidlin is a member of Solidarity now living in Québec, and an Assistant Professor of Sociology at McGill University. This article was originally published in Jacobin Magazine.